In March of 2014, I was asked to review science fiction and fantasy for Invincible Love of Reading. I decided to inaugurate my reviews with an old favorite of mine. Forerunner Factor was actually two novels, Forerunner and Forerunner: the Second Venture. When Melissa Frye decided to stop moderating Invincible Love of Reading due to health issues, I made the decision to strike off on my own. I decided to inaugurate my reviews for the newly independent Kurt’s Frontier with another favorite; one I’ve been wanting to get to. Search for the Star Stones is actually two novels. Zero Stone was copyrighted in 1968. This begins the tale of Murdoc Jern. Murdoc is an apprentice gem trader. His father was murdered by an interstellar criminal syndicate called the Guild. This is how he comes to inherit an ancient ring, large enough fit over a space suit’s glove. However, the Guild is now hunting him. He and his master are marked for death by an alien cult. His master dies, and Mudrdoc barely escapes with his life in the company of Free Traders. It is on this ship he meets Eet, a cat-like alien born from the ship’s cat. Eet has phenomenal mental powers. With Eet’s help, he must dodge the Guild and the Patrol (charged with interstellar law enforcement) to protect the ring—or rather the stone set in the ring. It is a stone created by a long dead civilization know as the Forerunners, and it is more than just an ornament. It has powers that neither the Guild nor the Patrol will hesitate to kill for. Uncharted Stars was originally copyrighted in 1969. Murdoc Jern and Eet have escaped the Guild and are on a slender probation with the Patrol, who wants to use them as bait to catch the Guild. They have a zero stone they’ve kept when the rest of the cache and Murdoc’s ring were turned over to the Patrol. They now have a ship with a blacklisted pilot, and are starting their quest for the source of the zero stones. Their hunt will run them afoul of both the Patrol and the Guild, but offers them tantalizing clues as to where the Zero Stones originally came from. Murdoc and Eet must pit their nerve and mental powers against the technology at the disposal of the Guild to win back a stolen star map. 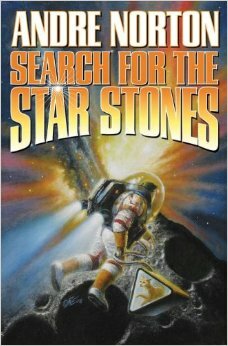 The Search for the Star Stones is a great read for long time science fiction fans. I always enjoy the late Andre Norton’s old school approach to science fiction, such as ship landing fins down. The tale is told in the first person and is thick with the dialect of Andre Norton’s universe. If you have a linguistic bent, as I do, you will find it easy to pick up on and quite enjoyable. There is also suspense as Eet and Murdoc try unravel the mysteries and dangers that surround the Zero Stones. However, the old school writing style Andre Norton favored does have a downside. She tends to rely on thick description to relate important bits of back story, which could try the patience of a modern reader. In the end, it is a fun read and one that brought a great deal of pleasure when I was younger. Great start, Kurt! I have no doubt your review blog will be a success. Thanks for the well wishes Missy. Thank you again for getting me started. Nice way to start off your new review. Good luck. Andre Norton is a long time favorite. Since I started with Forerunner Factor when I started doing reviews for ILR, it seemed like a no brainer. I’ve been wanting to reread Zero Stone and Uncharted Stars for a while anyway. Thanks for the ‘like’ Ken. The first science fiction book I ever read was Catseye, by Andre Norton.